Building on the success of PalmOne's Zire 71, the Zire 72 is the first Palm-based handheld that can capture digital video with sound and shoot digital still photos. 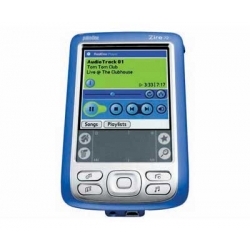 This multimedia PDA also features bright 320 x 320-pixel color screen for optimal playback of video and photos as well as voice recording capability and an MP3 player for listening to your own soundtrack. Other features include Bluetooth wireless connectivity, a 32 MB memory, Secure Digital card expansion, and a fast 312 Mhz Intel PXA270 processor. And, of course, the Zire 72 features Palm's suite of information management applications and the ability to edit Word- and Excel-compatible files and synchronize with Microsoft Outlook (Windows only).